Abstract. An approach is proposed to assess hydrological simulation uncertainty originating from internal atmospheric variability. The latter is one of three major factors contributing to uncertainty of simulated climate change projections (along with so-called "forcing" and "climate model" uncertainties). Importantly, the role of internal atmospheric variability is most visible over spatio-temporal scales of water management in large river basins. Internal atmospheric variability is represented by large ensemble simulations (45 members) with the ECHAM5 atmospheric general circulation model. Ensemble simulations are performed using identical prescribed lower boundary conditions (observed sea surface temperature, SST, and sea ice concentration, SIC, for 1979–2012) and constant external forcing parameters but different initial conditions of the atmosphere. The ensemble of bias-corrected ECHAM5 outputs and ensemble averaged ECHAM5 output are used as a distributed input for the ECOMAG and SWAP hydrological models. The corresponding ensembles of runoff hydrographs are calculated for two large rivers of the Arctic basin: the Lena and Northern Dvina rivers. A number of runoff statistics including the mean and the standard deviation of annual, monthly and daily runoff, as well as annual runoff trend, are assessed. Uncertainties of runoff statistics caused by internal atmospheric variability are estimated. It is found that uncertainty of the mean and the standard deviation of runoff has a significant seasonal dependence on the maximum during the periods of spring–summer snowmelt and summer–autumn rainfall floods. 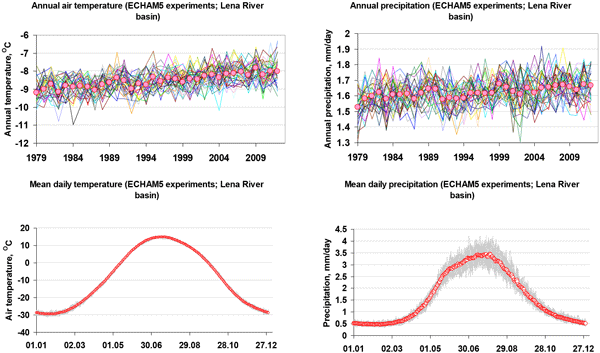 Noticeable nonlinearity of the hydrological models' results in the ensemble ECHAM5 output is found most strongly expressed for the Northern Dvina River basin. It is shown that the averaging over ensemble members effectively filters the stochastic term related to internal atmospheric variability. 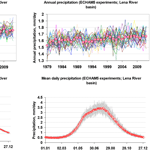 Simulated discharge trends are close to normally distributed around the ensemble mean value, which fits well to empirical estimates and, for the Lena River, indicates that a considerable portion of the observed trend can be externally driven. How to cite: Gelfan, A., Semenov, V. A., Gusev, E., Motovilov, Y., Nasonova, O., Krylenko, I., and Kovalev, E.: Large-basin hydrological response to climate model outputs: uncertainty caused by internal atmospheric variability, Hydrol. Earth Syst. Sci., 19, 2737-2754, https://doi.org/10.5194/hess-19-2737-2015, 2015. Our paper is one of very few studies where the influence of stochastic internal atmospheric variability (IAV) on the hydrological response is analyzed. On the basis of ensemble experiments with GCM and hydrological models, we found, e.g., that averaging over ensemble members filters the stochastic term related to IAV, and that a considerable portion of the simulated trend in annual Lena R. runoff can be explained by the externally forced signal (global SST and SIC changes in our experiments).